For more than 40 years now, Crouzet, has offered D.C. motors and geared motors, available from 1 to 600 W in 12, 24 or 48 V versions. Crouzet’s DCmind Brushless Motors are high performance direct current brushless motors, with output power ratings from 34 to 600 W and a choice of various integrated electronic control systems. The SMi21 electronic control unit is designed for motion control: position, speed and torque. It comes with a software interface, DCmind-Soft. When installed on a PC, this interface can be used to select, configure and download the motor’s motion program and to set parameters for individual applications. 6 inputs and 4 outputs, 2 of which are 10-bit analog inputs. Intuitive, easy-to-use setup software – with application mode for quick start-up. Very flexible thanks to the various programs on offer. All the parameters are adjustable and can be used to optimise application operation. Also suitable for a 12 V, 24 V or 48 V battery power supply (voltage range between 9 and 75 volts). Rotor position controlled with 4096-point encoder and use of sinusoidal vector control. Reprogramming and re-use of motors as required by changing the application program or by modifying the configuration. Firmware updating made easier with the ‘‘bootloader’’ function. Use on its own, in combination with other motors or controlled by a PLC. Brushless DC motors incorporating CANopen technology to allow you to network several motors are now available. Coordinate and synchronize every movement with high accuracy. Proven since 1980, the CANopen system ensures high reliability of data transmission through its error detection system. Please click here to view DCmind Brushless SMi21 with CANopen 3D file. Our DCmind Brushless Motors are available as direct drives or geared. Please refer to this table. The TNi21 electronic control unit is ideal for speed control and torque control. It connects via a connector or cables for immediate use, with no preliminary setting required. 2×10-bit analog inputs for fine-tuned speed and torque control. 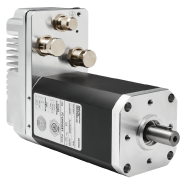 Use on its own or in combination with other motors or controlled by a PLC. Can be used in production immediately (without setup stage). Also suitable for a 12 V or 48 V battery power supply (voltage range between 9 and 75 volts). Here is a short overview of our Industrial DC Brushless motors.